In a recent study published in Scientific Reports, researchers at Kanazawa University show that an artificially synthesized molecule can exhibit compatible activities to natural molecules in its biological effectiveness. Growth factors are ligands that play important roles in the body – they are responsible for tissue regeneration, wound healing, and the maintenance and growth of cells. Stimulating growth factor-dependent pathways is therefore an important therapeutic strategy to promote the regeneration of tissues due to injuries and diseases. Using synthetic substitutes of growth factors is the primary method for artificially stimulating the desired pathways. However, synthetic substitutes are often not as efficient and comprehensive in inducing the required biological changes. Kunio Matsumoto at Kanazawa University and colleagues have recently created a substitute for one such growth factor, that produces a comparable biological response. The hepatocyte growth factor (HGF) binds to and activates a receptor, known as MET (Fig. 1). In other words, HGF is a native ligand for the MET receptor. The MET receptor is a transmembrane protein. Upon extracellular binding of HGF to the extracellular region of MET, pairing of the receptors (called ‘dimerization’) occurs, which allows the intracellular chemical change of the receptors (called ‘phosphorylation’). This receptor phosphorylation means receptor activation, which triggers activation of intracellular biological signal transduction pathways, leading to a variety of biological responses in cells. To mimic the actions of HGF, the researchers created a “macrocyclic peptide” molecule (named aMD5-PEG11) which activates the MET receptor (Main Fig). This molecule is composed of chemically cross-linked two macrocyclic peptides. Such cyclic molecules are flexible in structure and can bind and activate MET. Furthermore, aMD5-PEG11 docked onto to a different region of MET than HGF, aMD-PEG11 and HGF therefore did not directly compete for MET and nullify each other’s effects. Whether aMD-PEG11 also induced these structural changes, was then assessed in two different human cell types. aMD-PEG11 induced the same extent of coupling/dimerization and phosphorylation of the MET receptor in a comparable ability to HGF. The activation of a set of genes is responsible for specific biological functions. When the genes activated by aMD-PEG11 and HGF were respectively analyzed during 3-D tubulogenesis in human kidney cells induced by aMD5-PEG11 and HGF, changes in the gene expression profiles were largely overlapped and comparable between HGF and aMD5-PEG11. Because 3-D tubulogenesis by HGF in kidney cells implicates construction/development and re-construction/regeneration of a functional kidney, the comparable ability between HGF and aMD5-PEG11 to induce gene expression profiles suggests that aMD5-PEG11 can facilitate regeneration of the kidney in a potential comparable to HGF (Fig. 2). HGF (Hepatocyte Growth Factor) is a bioactive protein which exerts biological activities through the binding and activation of the MET transmembrane receptor. The extracellular binding of HGF to MET receptor induces association of two MET receptors (called “dimerization”), thereby the MET receptor can be activated. Activation of the MET receptor results in biological responses of cells, including cell proliferation, migration, survival, and 3-D tubulogenesis/morphogenesis. Because of these multiple biological activities, HGF supports regeneration of tissues and phase-II clinical trials recombinant HGF protein for treatment of patients with spinal cord injury and amyotrophic lateral sclerosis (ALS) are ongoing. HGF is composed of 697 amino acids and manufactured by recombinant protein technology as a biological drug. The authors discovered artificial HGF composed of chemically linked two cyclic peptides (aMD5-PEG11). This artificial peptide HGF can bind and activate MET receptor, in a comparable ability to HGF, a native ligand for MET receptor. Because artificial peptide HGF has biological activities compatible to HGF and it can be manufactured by chemical synthesis that can be manufactured at much lower cost compared to recombinant protein production, artificial peptide HGF is expected to be a next-generation biological drug manufactured by chemical synthesis. Moreover, the technology used to discover artificial peptide HGF can be fundamental technology for discovery of artificial peptide cytokines and growth factors for medical application. 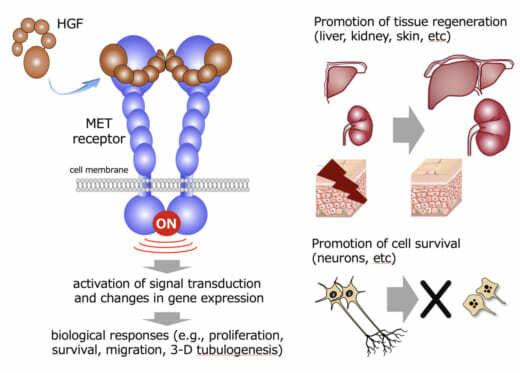 HGF activates MET receptor and activation of MET receptor triggers intracellular signaling leading to the enhancement of cell division, migration, survival, and 3-D tubulogenesis. These biological activities lead to the regeneration of tissues after injuries and diseases. Epithelial tubulogenesis (blanching duct formation) is critical for functional tissue architecture in several organs, including kidney, mammary gland, lung, and bile duct. In the culture of normal human kidney tubular cells in 3-D collagen gel, artificial HGF/aMD5-PEG11, as well as HGF, dynamically induce tubulogenesis. This biological activity is unique to HGF-MET receptor pathway. 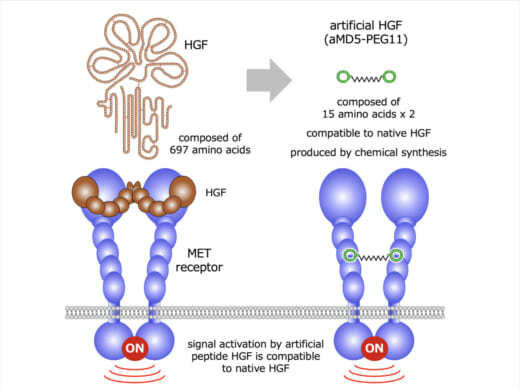 Therefore, artificial peptide HGF capable of activating MET in a comparable ability to HGF may be applicable to regeneration-based medicine as a new biological drug candidate. This work was supported by World Premier International Research Center Initiative (WPI), Grants-in-Aid for Exploratory Research (15K14473) from the Ministry of Education, Culture, Sports, Science and Technology of Japan (MEXT) to K.M., Scientific Research (C) (16K08544) to K.S., the Medical Research Fund of Takeda Science Foundation to K.S., and by the Project for Cancer Research and Therapeutic Evolution (P-CREATE) from the Japan Agency for Medical Research and Development.